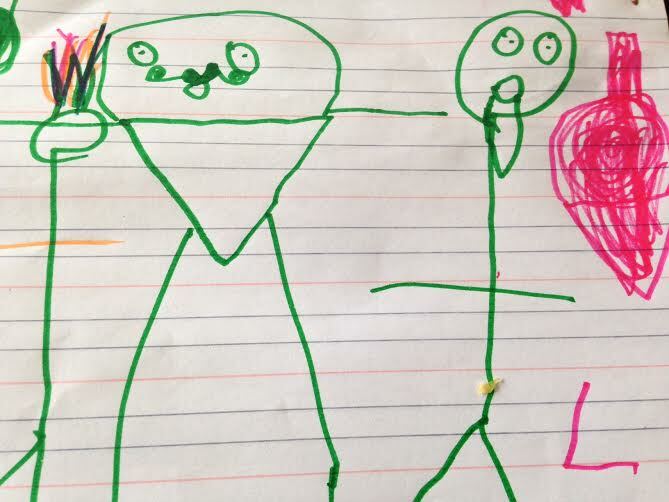 Older Single Mum: A Conversation with my Five Year Old. A Conversation with my Five Year Old. I love conversations with little children, especially those they have between them and when they're five years old, but this one was just my youngest and me when we were in my bed the other morning. Him: 'Not one like this' - he formed the shape of a Hitler style one across his upper lip. He took two hands and elaborately drew, from the centre of his upper lip, an imaginary long and glorious moustache with big curls up at the end each side. 'Like this,' he said proudly. Me: 'Oooh, lovely. One like this?' Taking his two handed cue, I mimicked a very long, magnificent one. Him: Horrified. 'Nooooo. I don't want one like Father Christmas! I want one of those little triangle ones.' And he showed me a very small, delicate little thing off the end of his chin. What kind of convos do you have with your kids? Love the chat. Love the beard and the mustache descriptions but that "I want a baby" comment hit me from left field. I guess it did you too? Love conversations with 5yos. 5 has been the best year so far in terms of interesting and exciting to see them grow up. Conversations with kids can be hilarious, and they only get better with age. Brilliant - that's made me giggle. We have plenty of conversations like that in this house - although they generally involve animals!